I think that it is probably fair to say that Jane Urquhart is an author of acquired taste. If you like “introspective” fiction — her books are only 20 yards wide, but they are 300 feet deep — you love her novels. And if you don’t (“this is so, so boring”), you want no part of reading another volume. Sanctuary Line is going to confirm both those opposing prejudices. You can put me in the former category as someone who loves Jane Urquhart’s work — and this novel confirms for me her place in the front rank of Canadian novelists. At the same time, if you hated her previous work, by all means give this one a miss — it will only confirm your dislike. The cultivated landscape of this farm has decayed so completely now, it is difficult to believe that the fields and orchards ever existed outside of my own memories, my own imagination. Even by the time I was in my early twenties, the terrain had already been altered — almost beyond recognition — what with the bunkhouses deteriorating and the trees left unpruned and therefore bearing scant fruit. But that was during the period when my aunt was beginning to sever parts of the property so that it could be sold to developers; a step, I believed then, in the march toward some kind of future, or at least a financial future for her, and for my mother, who had just begun to live here as well. Now my aunt is dead and my mother lives at a place called The Golden Field, an ironic moniker if there ever was one, especially in relation to the one remaining field at this location, its greyness in the fading light. Those are the opening words of Sanctuary Line and, if they don’t appeal to you, travel no further. On the other hand, if the way that Urquhart has started to outline her story sparks your curiosity, move on. You won’t be disappointed. I am of an age (and was born not that far from where this book is set) that the exploration of what produced me and my kind has more than marginal appeal. Urquhart does an excellent job of addressing it. It is tempting to say that Sanctuary Line is a novel about “change”, but that would be wrong — rather it is a novel about “transition” and the importance of those events in our personal history that have a lasting effect. The author’s premise is that more often than not, we cannot influence those events when they take place — but they will influence us for ever and ever. This is a memory novel: Liz, the narrator, who is now back at the orchard farm, remembers how indelibly she was influenced by what happened there in decades past, even if it is only now that she can understand the impact of the incidents of the time. The reader is invited to join her in slowly but surely filling up the canvas of her background. 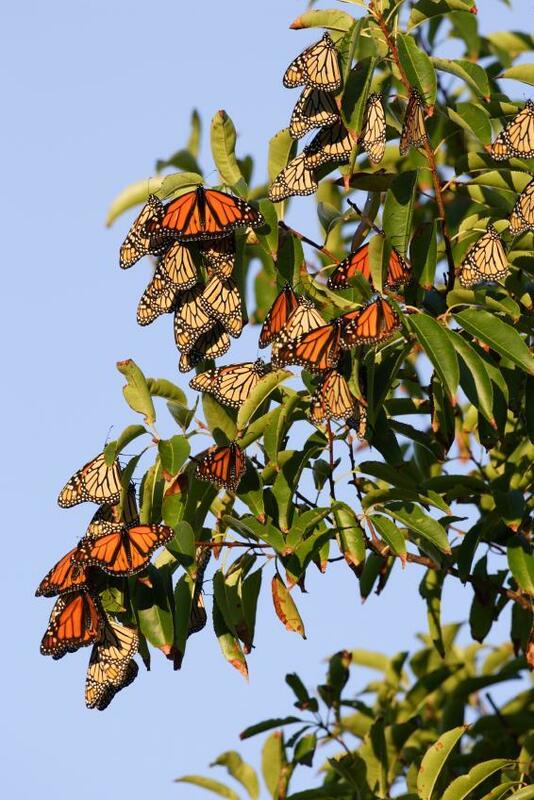 As for the monarchs, in those early summers we didn’t even know where they went or where they came from, depending on your point of view. We simply accepted them as something summer always brought to us, like our own fruit, or like strawberries or corn at the roadside markets, or, for that matter, like the Mexicans. It would be years before the sanctuary on the Point began to tag the butterflies in order to follow the course of their migration, and several years more before the place where the specimens from our region “wintered over” would come to my attention. Still, each summer we were stunned anew by what we came to call the butterfly tree. In the intervening months with winter upon us, preoccupied with school and other pursuits, we would have forgotten this spectacle, so its discovery was a surprising gift at the end of the season: an autumn tree that is a burning bush, an ordinary cedar alight with wings. Glancing down the lane, we would presume that while the surrounding foliage had retained its summer greeen, the leaves on that one tree had turned orange overnight. Then, before the phenomenon had fully registered in our minds, we would recall the previous occasions. In contrast to the butterflies, there is also the story of Mandy, Liz’s cousin who grew up on the farm. Mandy joined Canada’s armed forces and was a rising star — until an IED in Afghanistan ended her life. Urquhart is quite effective in contrasting the past and present without over-sentimentalizing either. It is tempting — indeed, almost inevitable — to say that Jane Urquhart lives in Alice Munro country, that section of southern Ontario that one of Canada’s best writers has effectively made her own in the world of books. Actually, Urquhart’s Ontario is both east and north of Munro’s but the comparison is fair: both are intensely interested in exploring how landscape — and generations of ancestral history — affect the present. I will admit that when I was reading this novel I frequently thought of Munro’s The View from Castle Rock, her own summary of her family history, told in a collection of short stories. Sanctuary Line is equally effective at evoking the idea that our history is always a part of us and that we will spend much of our life trying to figure out just how it is touching us right now. As is usual with Urquhart, there is a darker side to the story — the foreshadowing occurs early in the novel and that story line becomes increasingly dominant as it progresses. I’ve avoided it here, not just to avoid spoilers, but because for me the “plot” was a vehicle that maintained interest but was actually incidental to what I think this novel is really about. We all have history and, as we age, we all remember incidents from childhood and adolescence that influence that history. For me, that is the real strength of Sanctuary Line — it did not just cause me to wonder about the stories of the people around me, it caused me to wonder about my own. There is no more that I could ask from a book.